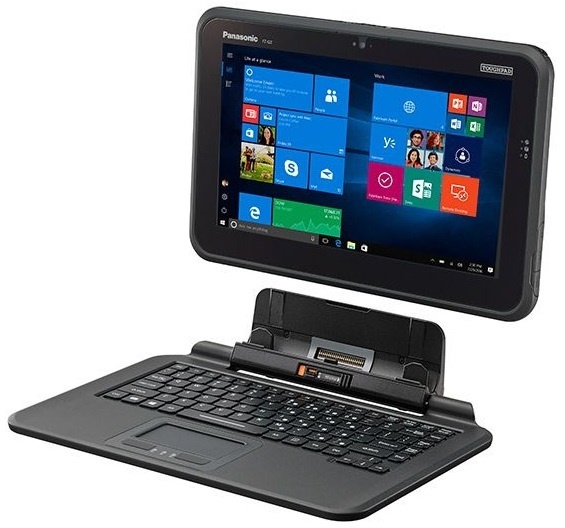 Panasonic Toughpad FZ-Q2 12.5" detachable semi rugged tablet offers 2-in-1 Windows 10 PC. Built with the rugged durability consumers have come to expect from Toughbook, this PC is designed for users who need more from their computer than what a typical consumer device can provide. Enhanced with features like a superior battery life and additional ports, the Toughpad FZ-Q2 semi-rugged convertible tablet also possesses a full HD display with an anti-reflective touchscreen along with a spill-resistant keyboard to maximize usability in the field or in the office. TOUGHBOOK FZ-Q2 is an enterprise-grade tablet, ideal for professional field applications that need more than consumer tablets and detachable computers. The TOUGHBOOK FZ-Q2 fulfills an unmet gap in the market for professional field workers who struggle with low–grade consumer markets. Featuring shock-absorbing technology, a serviceable battery, fanless, magnesium chassis, three-year warranty and resistance to dust and dirt giving it the durability and lower total cost of ownership you need. And as the only tablet in its class with an optional 4G LTE multi carrier modem with satellite GPS built in, it’s ready to go wherever your job takes you.